Over the past few months, I’ve had the opportunity to operate on a couple of terrific layouts whose owners have installed Soundtraxx SoundCar decoders to enhance the experience. Bob Fallowfield uses them on his CP Rail layout and Ryan Mendell has installed them on his Algonquin Railway. While the SoundCar is intended to be installed in rolling stock, Bob and Ryan have both opted to install them under the layout, where they feed speakers mounted near specific scenes. Both are using the SoundCar decoders to enhance operating sessions by contributing flange squeal and the distinctive “clickety-clack” of jointed rail. Bob has three SoundCar decoders on his layout – one in each work zone – while Ryan’s smaller layout requires only one, feeding two speakers. While one might assume that with fixed speakers, the sound would not follow the train as it would if the SoundCar was mounted in a piece of rolling stock, in both cases the layout-mounted speakers were surprisingly effective. It’s also worth noting that if one were switching, any SoundCar equipped rolling stock not actually in the consist being worked would be, in effect, a stationary speaker. At least with layout-mounted speakers, one has some control over the sound source. Bob and Ryan both work in HO. Since S scale is larger, I pondered whether I could fit a SoundCar decoder plus speaker into the tenders of my 10-wheelers and moguls. This would be the ideal solution, since the SoundCar decoders are consisted to a locomotive in normal operation anyway. With a speaker in the tender, the flange squeal and rail joint sounds would follow the locomotive – with or without a train. I took the body off the tender of CNR 10-wheeler 1532 today to investigate. The answer is “yes” – there’s plenty of room. But I would have to do some surgery. The tenders are modelled with the bunker for the coal portion – and the bunker is in the way of installing a decent-sized speaker in the tender. The good news is, if one were to cut away the bunker, there’s plenty of room – and the bunker is not visible under a load of coal. Another option would be to install the decoders and speakers in key spots around the layout – but I would have to re-consist the decoders every time I changed locomotives, or as locomotives moved from scene to scene. Still another option would be to install the SoundCars into cabooses and other equipment that brings up the markers. I can test this with my combines – which already have spare Tsunami decoders in them to provide a back-up whistle. If it works, I can modify my next set of cabooses to contain decoders and speakers (something I planned to do even before the SoundCar came to market). Yet still another option is to install the SoundCars in the tenders, but with much smaller speakers. Related to this: I believe the existing speakers in the tenders, while large, are not “high-bass” designs. Perhaps I can swap in a high-bass speaker for the main sounds, and free up some room in the tenders for a larger speaker for the SoundCar decoder. I ran the old Soundtraxx analog sound system with stationary speakers a long time. Since only high frequency sounds are “directional” small speakers in the locos worked fine. For the same reason even the best stereo system doesn’t need but one deep base speaker, one low frequency speaker might work fine for quite a wide area. My son was into audio stuff at the time, and I borrowed his 24″ deep base speaker speaker and enclosure. Steam train sounds would actually make the glass house windows vibrate! Or, you could do what I’m doing on my layout, Trevor. I have three curves on my Milan branch where I want random flange squeal. I’ll be using Iowa Scaled Engineering’s custom sound modules and IR sensors to trigger flange squeal and car sounds as the trains passes by. I’ll have fascia speakers. Their sound modules have up to 4 channels where you can import your custom sounds and modify as desired (this is very easy to do) and then play the sounds randomly. This way your layout won’t sound like everyone else’s who has a sound car and you can modify as desired. I will also be using their sound module for my river crossing (with birds) and interstate overpass (traffic sound). Good point, Scott. I use the Pricom controllers for my ambient audio system and I could simply add a “flange squeal” track and some sensors to trigger it. This would be particularly effective in the Lynn Valley, where most of the curves are on the layout. The Pricom system can be triggered by motion detectors or optical detectors so I have plenty of choices. If you’re like me, ambient sound is a necessity. My river crossing sound includes slow moving water with bird sounds and puts me in a very relaxed mood. Add a locomotive sound and it’s perfect for running trains and basically puts me in a happy place. Thank you for adding me to your blog. I am modeling an O Scale traction line that inter-changed far more steam road cars than electric railway cars. A large amount of it will represent its office, shops station freight house and carbarn. The track gauge will be 5 ft. the remainder built to p48 standards. I will post photos when there is more progress. I’m a fan of Bob Hegge’s Crooked Mountain Lines and have written about a CML boxcar I run on the layout. Search for “Hegge” on this blog and you’ll find the entries. I misplaced my password. Please remind me of it. Thank you. You don’t need one to comment Charley. Cheers! – DreamPlayers + IR detection have been used for “location specific” curve flange-squeal/diamond “ka-dang-a-dang” previously to good effect. The trigger capability is well documented, and the sound file can be designed to appear positioned at, between, or even beyond the speaker array. – The one thing the CKT-SQUEAL has over the DreamPlayer is built-in “loopable playback”, where the playback duration can adapt in realtime to the length of the “trigger input” (press and hold the trigger, the sound will start and continue looping. Release the trigger, the loop finishes and then “ends gracefully”). – The DreamPlayer has the benefit that you already own it, and if it has one or more “tracks” still unused, it could well support this mission without furthur purchase. and augment with DreamPlayer “location specific” effects if/as required. Scott, Creosote is actually one of the easier smells to replicate. Readily available and easily directed/invoked using cheap PC fans. My first avenue of investigation will be to hook up a smaller, high-bass speaker and do a subjective sound comparison. If the high-bass speaker sounds as good (or better?) than what’s already in the tender, I’m good to go with my in-tender SoundCar installation. Putting the SoundCar in the tender is my preference for a few reasons. For starters, the SoundCar co-ordinates with the throttle, so clickety-clacks and flange squeals are speed appropriate. The sounds also cease automatically when the locomotive has come to a stop. And of course the sounds will originate from wherever the train happens to be. My layout is very long and narrow, so that could be an issue. That said, I am thinking of a hybrid option. I worry that the flange squeal may be excessive. Fortunately, I note that the SoundCar’s CV 201 allows one to set “Flange Squeal Probability”. I’m thinking of setting that to a lower value, so flange squeal only occurs infrequently. And then, because I have one section of the layout – the Lynn Valley – where I have lots of curves, I’m thinking of using some detectors and my DreamPlayers to add some location-specific flange squeal effects. If I use short sound files and am careful about positioning the detectors, I can add squeal in places where it’s likely to occur, while ensuring that the sound file only plays in locations where it’s unlikely a train would stop. I want to make sure I don’t end up with flange squeal noises occurring while the train is stopped at the Lynn Valley water tank, for example. Much to think about – lots of experimenting to do. I’m looking forward to it! Interesting stuff to ponder. I purchased 3 Soundcar modules with Keep-Alives for trying out and thought about installing them in a few cabooses used on local trains. 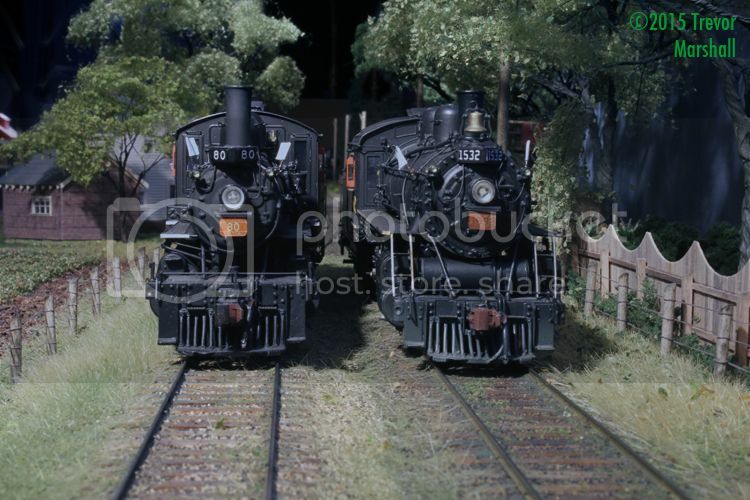 Now I am thinking of taking 1 and putting it under my main yard so it can consist with the yard loco. Hadn’t thought of that idea. Will save me a keep-alive too. And it would make sense to dedicate one for use on my Free-mo module which features a small yard, consisting that with the yard loco there. I’m thinking I can make the decoder and speaker(s) into a transportable box that I just place under the module, maybe up near the tracks attached to the frame. Just need to make sure I keep the decoder easily “consistable” in that box. Mayube I can do that before the Springfield show. Thanks Trevor for stirring up some interesting possibilities.